I haven’t done a meme before and this one care of Ruminations seemed relevant given the time of year. Things you haven’t done and don’t want to – leave in plain font. while sleeping under the stars- as a kid. Been sailing for a few weeks on a yacht but a cruise on one of those large ships seems boring. 49. Seen the Sistene (sic) chapel in person. Well it was one flower- nicked from a neighbour’s garden but it was a rose so that counts right? Entirely in error of course. But I left one after one day on the understanding that it just wasn’t going to work out. A very small one- in a toe. I had almost forgotten. Was called but not selected. There are many things that I would like to do that are not on this list. Perhaps I should start a bucket list. I wrote about how much my laptop was helping my productivity and online learning in June. Well yesterday it broke. 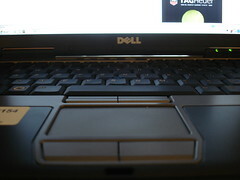 Apparently it is something on the motherboard and needs to be looked at by Dell – which could take a few days. I was grateful that it wasn’t the hard drive because, even though I KNOW different, a large proportion isn’t backed up anywhere. My IT colleagues have lent me a replacement laptop and transferred the contents of the desktop folder on the old hard drive to this one. So I am operational – somewhat. Which is actually the point of this post. Voyager (library software) circulation module. This is absolutely necessary and I had to reinstall it. Firefox bookmarks – I have only been saving a my research bookmarks to Delicious not the bookmarks in my toolbar that I use everyday. I will be changing this as a back up. Firefox plugins and bookmarklets- delicious and google email/share are the ones that I am missing most so far. WordPress “press this” bookmarklets for the different blogs. desktop feeds- I have been using Feeddemon and trying out Outlook 2007 to access our firewalled feeds from our blogs and wiki. Snagit- really missing as I am trying to write an induction powerpoint and have to update the screen shots. Adobe Acrobat. We send out a lot by PDF and some need editing. Office 2007. The corporate default is 2003 and I was allowed to try out 2007 to test the RSS feeds in Outlook 2007. Despite everyone hating it and some initial frustrations I have rapidly got to like the new layouts epecially the categoires and task management in Outlook. I was heading to “inbox zero” as a benefit. There is probably more but that’s what has come to mind after 24 hours. What would you miss most?